High blood pressure, or hypertension, is a huge problem in our modern world, but many people don’t even know they have it. This is why high blood pressure is often referred to as the silent disease. It is considered a high risk factor for cardiac arrest and symptomatic of clogging arteries. But even with it’s silent presence, you shouldn’t be too worried – you can utilize numerous herbs and foods for high blood pressure for treating the issue naturally. The CDC estimates that approximately 1 in 3 Americans have high blood pressure (HBP), so you can understand why discovering ways to lower blood pressure naturally is important – especially since prescription drugs are expensive and have numerous side effects. Recognizable symptoms of high blood pressure include heart palpitations, feeling overheated easily, and experiencing dizzy spells. The most likely populations to have high blood pressure are the overweight, pre-diabetics, and full blown diabetics. Systolic is the first number of a blood pressure reading and is generally the higher number. 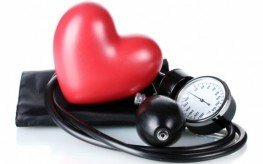 Systolic measures blood pressure as the heart pumps. Above 140 is considered HBP. Diastolic is the second and generally lower number. Diastolic measures blood pressure during the heart’s resting points, and over 90 is considered high. You can use blood pressure reading devices located in pharmacies and health food stores, but realize that your readings may vary. Chronic high readings wave a red flag, though. Try to average them out. Here is an info-graphic to help you understand your specific readings. It’s important to know that mainstream HBP dietary concerns with high sodium intake are misleading; we need sodium. Processed and fast foods are too high in sodium from toxic processed salts. Even worse and unrecognized by mainstream medicine are refined carbs, especially corn syrup (HFCS) used in processed fake foods. Avoid those and eat organic whole foods using real unprocessed sea salt and natural sweeteners. 1. Renowned for increasing cellular energy and promoting heart health, Coenzyme Q10 (CoQ10) is naturally produced in the body, but levels drop off as we age. It is vitally important for anyone taking statin drugs to supplement CoQ10 liberally, as statin drugs inhibit CoQ10. Two studies have demonstrated significant reductions with systolic and diastolic readings in three months or less from taking CoQ10. Holistic cardiologist Dr. Stephen Sinatra, MD, recommends using 50 to 100 milligrams of CoQ10 daily if you have any cardiovascular disease risk factors. 2. L-Arginine is an inexpensive supplement co-factor for creating nitric oxide (NO), a chemical also also stimulated with exercise. It’s a gas molecule that helps keep blood vessel walls flexible, which is an important property for lowering blood pressure. 3. Vitamin C and Lysine in high doses is part of two-time Nobel Prize winner Linus Pauling’s recommendation for creating strong and flexible blood vessels. Ascorbic acid is recommended to achieve sufficiently high doses of vitamin C.
4. Hawthorn berry is a traditional Chinese herbal medicine tonic for the heart and cardiovascular system. Hawthorn can be best consumed as a tea or tincture. Several studies have agreed that Hawthorn is as effective without side effects as pharmaceuticals for HBP. 5. Ginger has demonstrated blood thinning properties as well as calcium channel blocking, which keeps calcium from entering the heart and adhering to inner artery walls to create blockages. Some pharmaceuticals for high blood pressure are calcium channel blockers with side-effects. Ginger taken in capsules or made into teas with thin ginger root slices is quite safe as long as you’re not taking other blood thinners, including aspirin. 6. An enzyme extracted from natto, a Japanese food made from fermented soybeans, Nattokinase clears artery blockages. Avoid this if you have a bleeding problem and takes medications for it. Otherwise, nattokinase supplements are safe and effective. When choosing a nattokinase supplement, be sure it has retained vitamin natto’s vitamin K2. Vitamin K2 transports calcium out of blood vessels and into bones where it belongs, which helps prevent calcification in the arteries and heart. 7. Stress is a high blood pressure factor. Improve your stress levels by meditating, practicing yoga, and moderately exercising. Relaxation and ridding your life of stress are keys to not only normalizing blood pressure, but improving overall happiness and well-being. For more natural remedies, be sure to check out our home remedies for high blood pressure page. i have read that lyzine reduces the l-arginine levels and the two should not be taken together. this is why i don’t add lyzine because of possible ed i take argin max which has 3000mg of argine. am i wrong to be concerned? It is a good idea to try and lower your high blood pressure with Ginger. It is good for you and has numerous positive side effects. Ginger is an herb. It can be used as a spice and also as a medicine. It contains allicin, a substance which has antibacterial, antioxidant, lipid lowering and anti-hypertension properties. It's a silent and killer disease! A lot of my relatives have hypertension and have died because of this disease that's why as early as now, i'm trying to live a healthy lifestyle by eating the right kind of food and exercising as well. Good thing that you've discussed all this 7 food herbs that can reduce high blood pressure, it's a great source of information and i'm sharing this to the family.